Time Travel, a famous author, Aliens, UFOS and Government Conspiracies are all in this remarkable new series from the quill of the man known around the world by one name which is SOLLOG. Sollog is a prolific author with over 100 Titles and Academic Papers to his credit and in this book Sollog creates a new series of books about the most amazing thing about Sollog, that he is world famous psychic that has fans around the world that SWEAR HE KNOWS THE FUTURE. In AMAZING ADVENTUES OF SOLLOG The Time Traveler Sollog jumps back and forth in TIME and then links to time stamped records he put all over the internet in places such as Usenet and YouTube and even into court records and newspaper articles where he shows in the PAST he wrote out THE FUTURE which has now occurred. 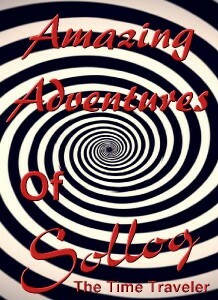 Sollog skips through his AMAZING ADVENTURES with the flair of the Mad Hatter and also the stoic fearlessness of Morpheus.